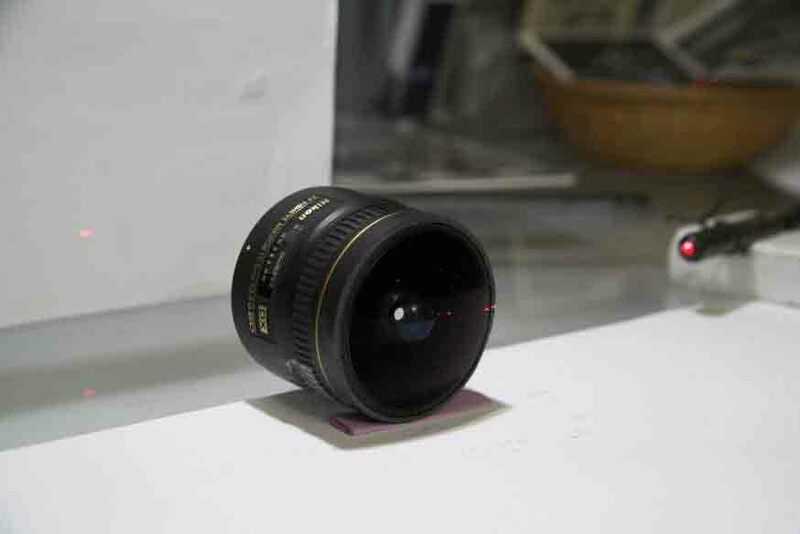 From my point of view, these two lenses are currently the most popular short-focal-fisheye lenses that are used by the Panorama Photographers. The Nikkor 10,5 mm has lately made the news to curiously become one of the best mate to the ... Canon full frame 35mm DSLR esp. the recent Canon EOS 5D. The association EOS 5D + Nikkor 10,5mm resembles the familiar ((any DSLR-APS-C) + Sigma 8mm) combo in so many ways that I decided to make a comparison. 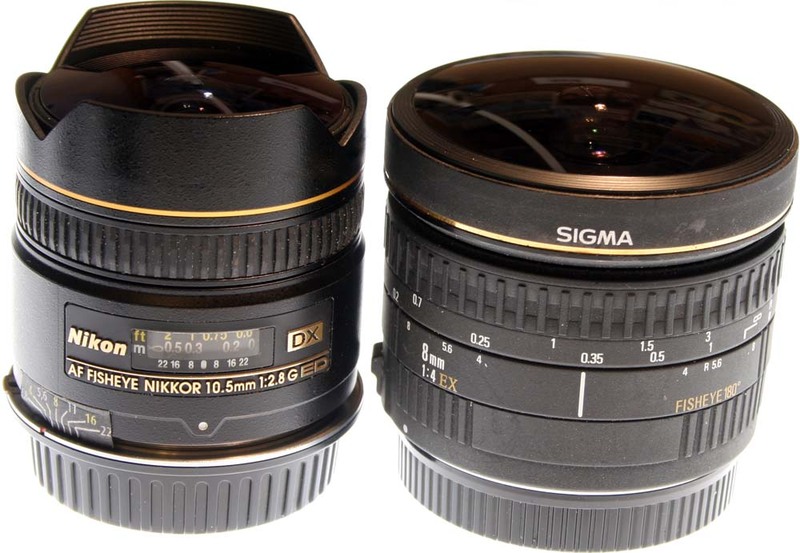 (Nov 2006): An older short comparison between FC-E8/18-55mm and Sigma 8mm f4 is here. 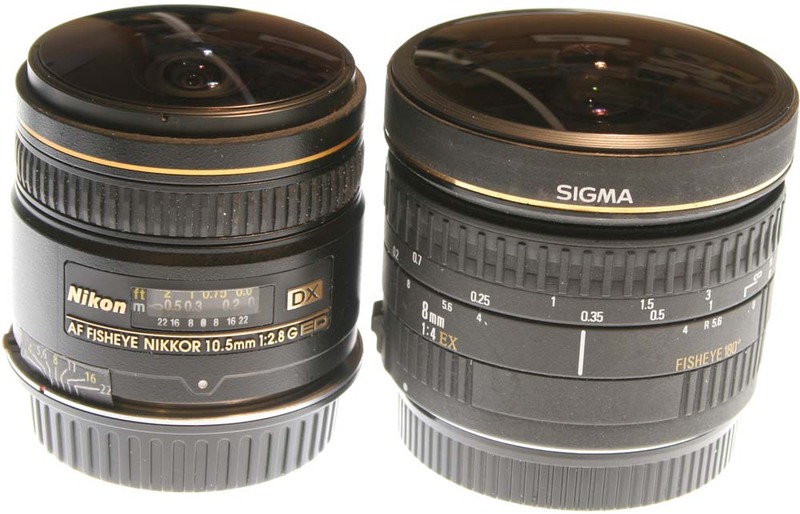 (Dec 2006) : A newer and much improved Sigma 8mm f/3.5 has been lately introduced on the market. It is reported to be so different from the former version that I have to redo the comparison test. Unfortunately at the time of writing, I could not put my hand on one as the stock were emptied on the world market few weeks after introduction! The Nikkor lens is much more compact and lighter as well. From Canon RAW images: Many thanks to Romuald Vareuse for the friendly procurement of these test images. Removal of chromatic aberration in PS CS2 Camera Raw. Sharp masking or equivalent filtering was avoided. The Nikkor lens is obviously superior to the Sigma as far as sharpness and contrast are concerned. In fact, the sharpness is so good up to 180degrees of FoV for the Nikkor lens that little improvement comes from insertion of a Zenit shot: Using three or four images equally spaced and shot on a 35mm Canon DSLR gives almost as good a panorama than with these extra shot. It's completely different with the Sigma where using the sharp core of the image from the Zenith shot obviously always improves the quality of the panorama. Note: Another version of this paragraph is available in french. It is more detailed. Just looking at the source images, one can feel that something is different in the mapping of those two lens. 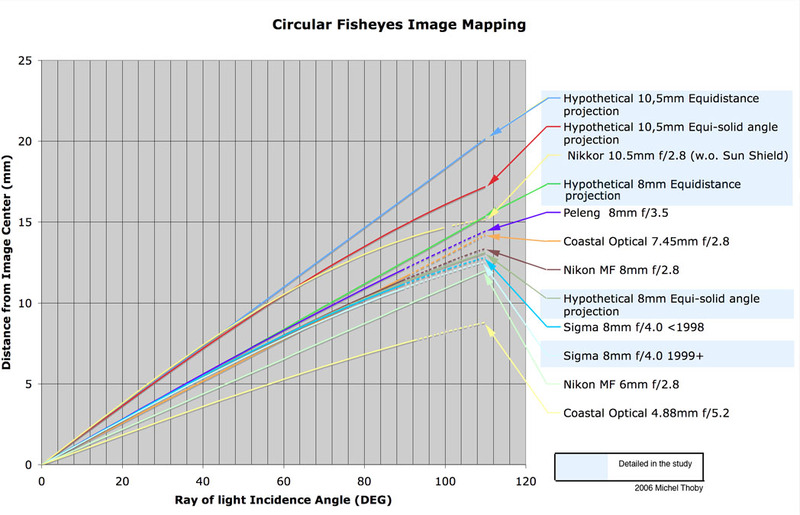 I am currently collecting data for the angular mapping of common fisheyes (i.e. radial position R vs. angle theta). I will calculate correcting polynomials, which will be included as correction settings in the next release of my free program "Panorama_Tools" (<http://www.fh-furtwangen.de/~dersch>). 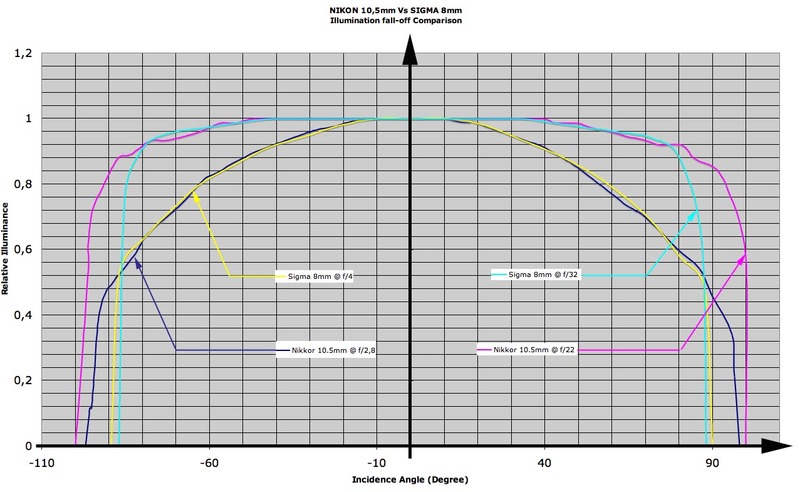 So far I have data for the Nikon 2.8/8mm and Sigma 4.0/8mm (Both thanks to Steve Morton). 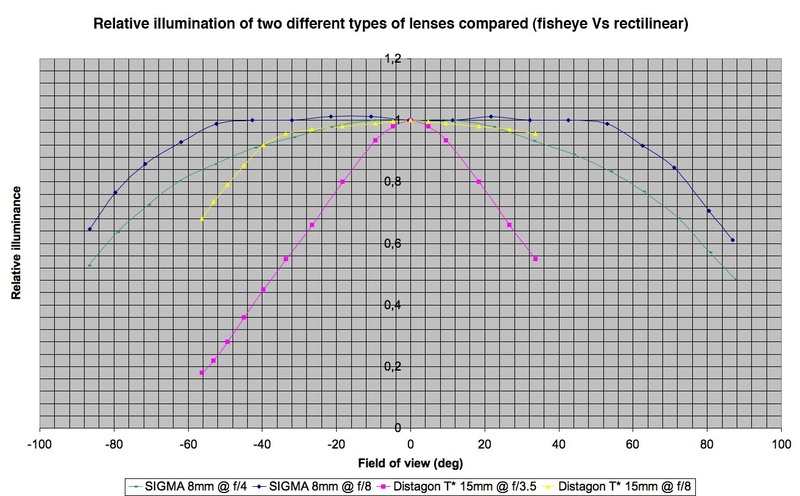 The lenses for which I have data interestingly don't exhibit the "ideal" fisheye behavior (i.e. R = C * theta) but rather (R = C * sin( theta/2). This resembles the image of a spherical convex mirror. From what I remember about basic optics this also appears to be the "natural" mapping of a strongly curved lens, and I assume that most other fisheyes do have this property, too. Does it matter? The image becomes squeezed at the edges (3.7 degrees/mm in the center vs. 5.1 degrees/mm at the edge). By looking at a fisheye image you can't tell whether it exhibits one or the other kind of mapping, but you can clearly see differences when comparing the same image in two different mappings (You can switch between the two using my "Panorama_Tools"). It will become important if you convert the image to panoramas, especially if you have to stitch several images, which aren't perfectly aligned and require perspective corrections. Users of my program "Panorama_Tools" can use the "convex mirror" mapping which, at least for the Nikon and Sigma, is better than the ideal fisheye mapping. I will address this issue in the next release. I wonder what the commercial products (IPIX, PhotoVista) assume about fisheyes, and I also wonder how other fisheyes perform. From my own experimental measurement, the mapping function of the Nikkor 10,5mm AF DX f/2.8 is R = 1.47 x f x sin (0.713 x Omega). The measured focal length is f = 10.58mm. 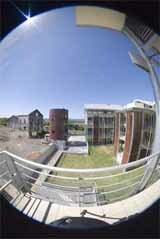 This may be the farthest from the theoretical formula amongst all commercially available circular fisheye lenses that have been tested so far. It is therefore nearly abusive to put it in the so-called Equi-Solid Angle projection class. It's the first and probably the forerunner of a completely new kind of commercial lenses that is technologically in-line with the currently evolving "digital world". Nikon has designed a "System" in producing both the lens and a software that can make correction of the aberrations and distortion of this lens and taking into account the computing power of present and future CPU. By optimizing all the features that makes the image sharper while still having a fast (f/2,8) lens in one of the more compact design possible, Nikon has let the distortion to be unusually high and succeeded in offering a very good product. This lens had been originally designed and patented exclusively to cover a FulFrame APS-C sensor (i.e. 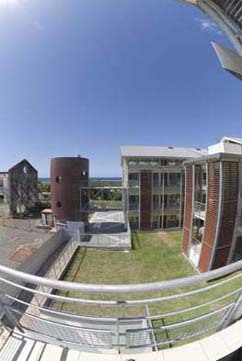 180 degrees FoV along the 28.43mm diagonal of this smaller rectangular sensor). On this modest imaging area, the distortion (that is mainly radial compression) is only slightly more severe than the other lenses of its kind but hardly noticed by the user. 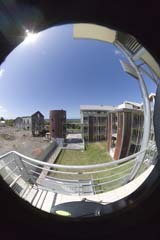 As about six shots should be done in portrait mode to cover 360 degrees around, only a maximum of 84 degrees of FoV (diagonal) of each are visible in the final panorama: this lens was felt not to deviate substantially from the norm until someone (Peter Murphy) cleverly thought about using it on a 35mm Canon DSLR. 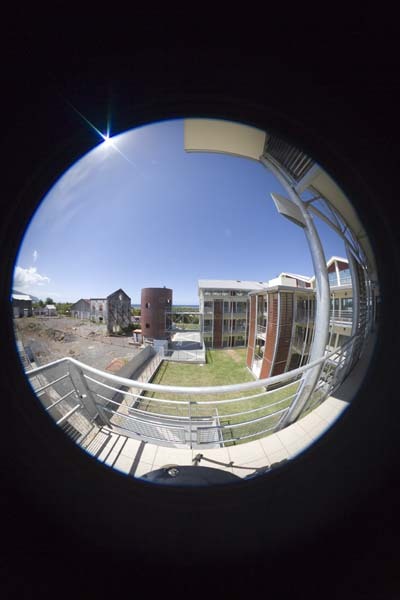 When the sun-shield of the lens is sawed-off, the angular coverage becomes circular and most of the image circle can be recorded on the 24x36mm sensor. In fact ~140 degrees HFoV is got in portrait mode with almost 200 degrees VFoV(of which 194 deg are "clean enough" to be possibly usefull). Three images are then sufficient to cover the full sphere with lot of margin and overlap! If at least one pair of control points comprises one of the two points that is located very near the edge of the coverage (let's say if Omega > 95 degrees) the Optimizer may compute image correction parameters and HFoV of really weird and high values: HFoV as high as 260 degrees for example could be (wrongly) computed by the Optimizer! In trying to force and fit the Nikkor actual mapping into the built-in "standard" Equi-solid projection function yields such a wild result. In effect, this leads to distort too much mainly the parts of the images that are finally not going to be included in the rendered panorama (i.e. 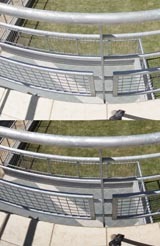 those parts that overlap between two adjacent images and are then cut-off in the process). The visible part is also of course slightly distorted in the equirectangular format, but one has really to know that, to be able to notice the distortion. The above statement happens to be in fact partially wrong. As I presently own both a Canon FF (EOS 5D) camera and the Nikkor 10.5 mm Fisheye, I have had the oportunity to test more in depth the consequences of this unusual angle of view/strong distortion combination factors. Both PTOptimizer (within PTGui or PTMac, at least) and PTGui Optimizers are in fact very well able to find the correct way to handle the distortion along the overall large angle of view. But I have found that many other uncorrect solutions with large (and uncorrect) FOV high value can be equally proposed by these Optimizers. This is especially the case when control points are automatically generated from PTGui for instance. By placing manually, carefully and precisely a lot of control points pairs also on the peripheral area, where at least three images overlap because of the very large FOV, the number of trivial solutions can be reduced to only the real and expected valid one. The proposed (by the optimizer) FOV is then truthfully valued at about 195-200 degrees depending of course on the selected cropping circle diameter. 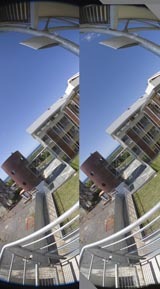 There is almost no apparent difference in the output panorama when it is made from three or alternately from four equally angular spaced source images. This demonstrates again the very good optical sharpness of the lens on a large range of angle of view: only very slight degradation happens for less than 120-140 degrees. 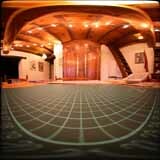 How the mapping for these two lenses compare to most other circular fisheye lenses? ...and please note the real difference from the usual fisheye model that was introduced by Nikon with this modern fisheye. When breaking the initially intended boundaries of the APS-C format is done, the Nikkor lens images should be used with an adapted process for panorama-making. Cropping prior to PanoTools could be used to reduce the circular field of view from, say about possibly196 degrees down to about 180 degrees (if no Zenith/Nadir shot are available) or even better to less (e.g. <130 degrees) if those shots are placed at their normal locations. Simultaneously, cropping to the lower needed dimension is also a good thing to do. On the other hand, if control points need to be placed in this peripheral area (for exemple because this is only where distinct features edges are visible), beware of the (mild) consequences. Please read the Up-date 23 March 2006 above that contradicts somewhat these recommendation. I feel sorry to perhaps having misguided some early readers. 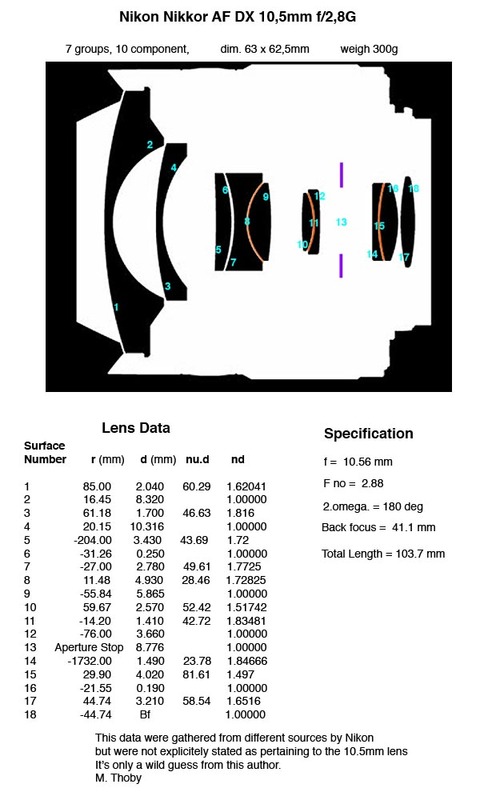 I have presented some studies about this lens a while back on other pages. The maximum angle of view is 180 degrees at f/5.6 or f/8.0. Actually it is a bit more when f/4,0 is selected and a little less when f/16 is used. The No-Parallax Point (in short: NPP, that I then loosely called Nodal Point) location as a function of incident angle, was plotted from measurement by the LASER pointer method with an improved optical test bench (NEW). Note that the graph is more or less a straight line and not the (dotted line) curve that I had wrongly extrapolated in the past. The same test with a LASER pointer has been performed in order to determine the "ultimate angle of view" and the location of the NPP along the Optical axis as a function of the Angle of view. The light barely enters the glass from the air but actually does: the light comes out and strike the background white paper screen after passing through the pupil. The maximum Angle of View is then found to be 203 degrees! Only one configuration has been assessed during the test: Moderate aperture (f/8 probably) and focus set at infinity. A more accurate and more complete test has been performed to determine the influence of Aperture (Let's thank Nikon for having kept the mechanical command!) and Focusing distance on the NPP location. This shall eventually supersede the previous above result. I also have now modified the EOS/Nikon Adapter to work around the lack of Aperture Ring on the Nikkor lens barrel. It made the experiment easier to perform. These graphs show the relative excursion of the NPP in four combinations of extreme values (f/2.8-f/22 and 0,14m-Infinity). There is a variation but it is very moderate. 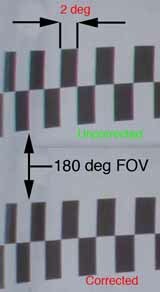 IMPORTANT: This variation is to be compounded with the motion of the front lens during focusing as it extends FOUR millimeters forward (with respect to the "infinity" position) when the lens is set for closest focus (0.14m) as the reference is the front vertex of the lens. The front vertex moves along the optical axis during focusing. 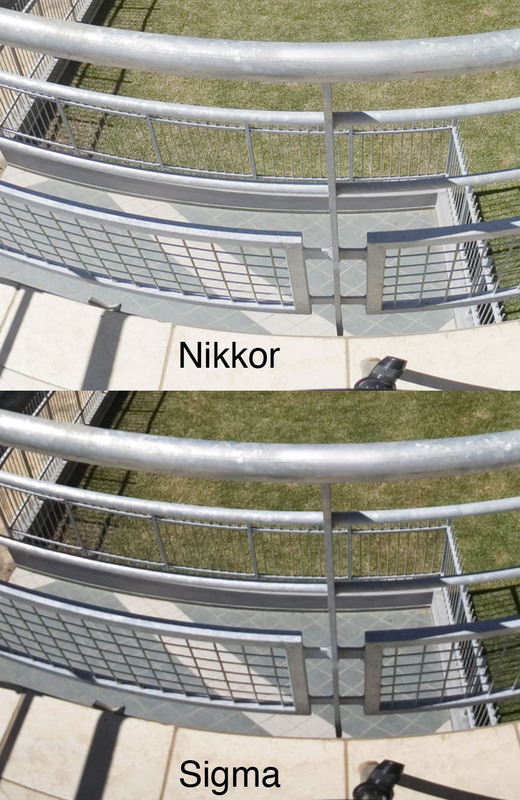 There is a considerable difference due to the surprising Maximum Angle of View of the Nikkor lens. 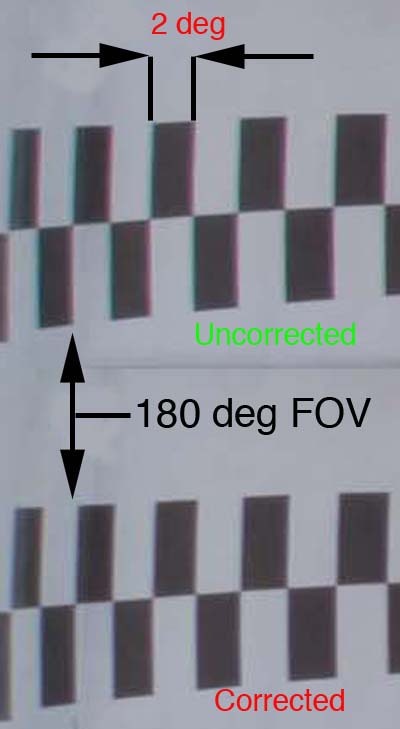 This ~200 degrees value is illustrating the reason for the very high images overall quality that one can observe from that fisheye lens in the more restrained range of normal use. As the stitching process shall discard finally the part of the image beyond 180 degrees (the "blurred and compressed part"), this large field of view is a performance margin. As No-parallax Point position along the optical axis is concerned, there is almost no difference between these two lenses (in the common angular field of view range)i.e. nothing that needs to be commented, I think. 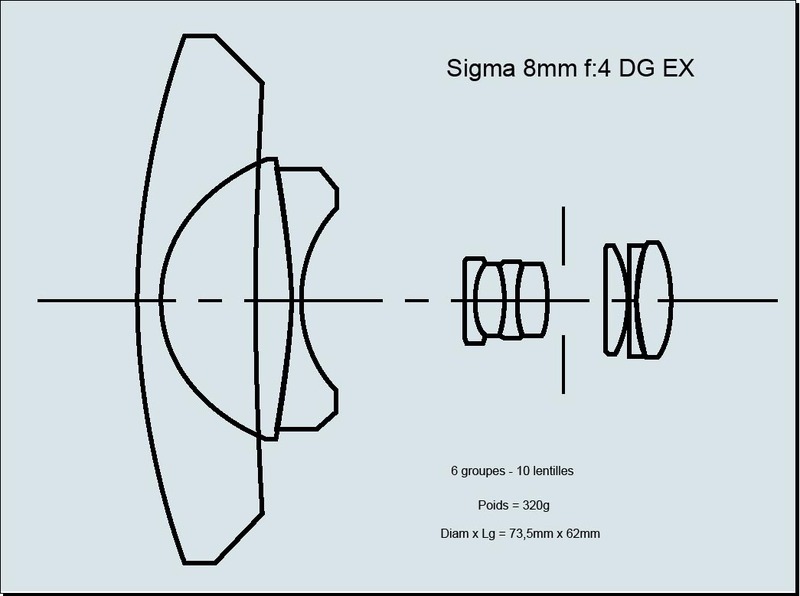 Important note: SIGMA has improved the design of the Sigma 8mm f/4 EX lens to become DG EX. It is said that an improved multilayer coating was applied on the rear surface (Surface #18 on the image above). This is supposed to reduce flare due to reflexion of light between the digital sensor glass filter and tis rear lens. My observation was done on the older design that is still widely available today on the web as well as in retail stores. This lens is well known to be subject of flare ghosting. It happens when the sun (or a light source) is at certain incidence angle to the optical axis. Sometimes, a simultaneous loss of global contrast is observed. Observe the effect of flare. Observe the evolution of the flare pattern: it gets worse as the aperture pupil is open and wider. This is generally what would be expected. The Nikkor 10.5mm is known as being quite immune from flare while it may happen sometimes however. I have found that it behaves somewhat in reverse way to the Sigma 8mm: the smaller the aperture is set, the worse the effect of flare becomes evident. This movie was shot within seconds from the Sigma equivalent at the very same place on the same tripod but on a different camera (EOS 5D rather than an EOS 20D). BTW please observe (on the left of the image the manual rotation of the lens, tanks to this adapter modification! The flare effect is almost not visible at the widest opening but a slight softening of a part of the image is there present! That is why this lens got the reputation of immunity. At very small pupil opening (f/22) a rather important effect is visible. Both lenses exhibits some flare effect in very similar incident angle of the perturbating strong light source e.g. sunlight. But flare is very often obvious and annoying with the Sigma because it happens at the most commonly used aperture stop setting range i.e. f/4 to f/8. It is not so hampering with the Nikkor as flare is present at the higher aperture stop stting i.e. f/16 to f/22 that are rarely set on this type of fisheye lens by most of the users. This is rather an illusion though, as some softening of the overall or at the least a big share of the image is insidiously present. 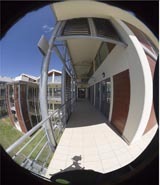 Fisheye lenses are not intended to be used for close range photography. 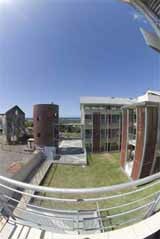 Anyhow I have done some "macropanoramas" to show the world differently. Do do that, I had used the Sigma 8mm set at very narrow aperture opening (f/16). The Depth of Field is then almost infinite from the front glass surface of the lens. The Nikkor 10.5 mm f/2.8 shows the same behavior when the aperture is closed to a value such as f/16 or f/22. 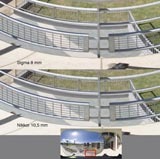 The enormous depth of field is a specific feature of alll short focal length fisheys lenses when aperture is closed down near possible minimum pupil size. There is a different story when the aperture stop is set to fully wide open (f/4.0 for the Sigma and f/2.8 for the Nikkor respectively). 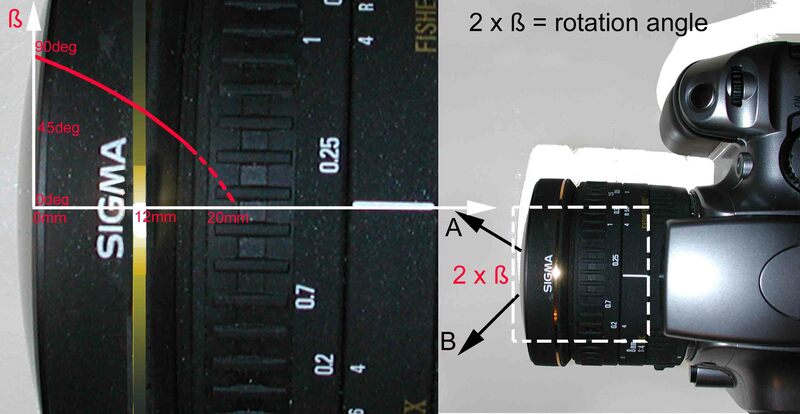 The closest distance from the focal plane of an object for which the image shall be sharp is 20 cm (8") on the optical axis. When the incidence angle increase, the enveloppe of the sharpest point seams to be nearly coincident with the plane that is normal to this optical axis at 20 cm from the focal plane. The DoF is then quite large as sharpness is almost got from there to1 to 2 meters and infinity is discernable. 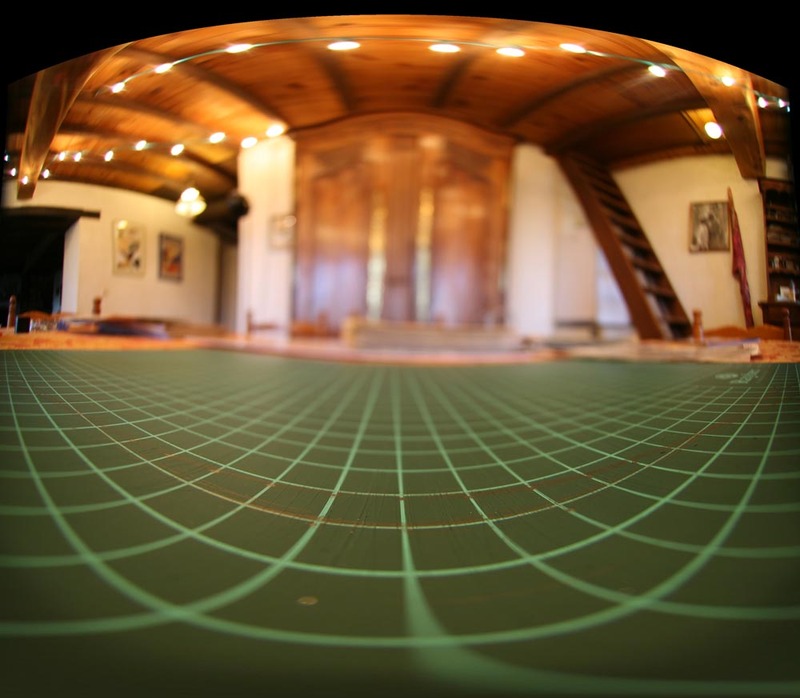 To start with, it is better to find how is shaped the Depth of Field (DoF) in 3 D of such a lens. DoF is not constant along the very wide range of incidence angle (-100 Deg to +100 Deg). I could not get information on the web about the real mapping, beside the single value found on the classical DoF table provided by the manufacturer. This single datum is (probably) implicitly specified for the distances measured along the optical axis only. In fact, when the aperture stop setting is set at the widest opening for any reason (e.g.low light), DoF is then reduced to about nought. The sharpness "space" is therefore reduced to a weird curved surface. It cannot be a sphere (as I first thought it to be) but it is not a plane either showing here a difference from the Sigma result. It's kind of a mix between these two possible cases. That mixed result is obvious when looking at the output of a simple experiment shown by this QTVR movie (500 kB). The distance of real focus is somewhat longer when the angle of incidence is very large but much shorter than if it was in the normal plane. In the paraxial region, the surface is approximated by the plane perpendicular to the symetry axis (optical axis) as it is for standard rectilinear lenses and also for the Sigma 8 mm. When the lens aperture is closed down to the minimum pupil size (f/22), the two lenses show similar output images: sharpness is good from the front lens surface to infinity. This setting should be used for Macropanorama making when possible, unless really blurred background is desired. At f/4.0, DoF goes from about 18 cm to about 1 meters: infinity is slightly blurred. At f/4.0, DoF goes from about 14 cm to about16 cm: infinity is really blurred. CA and CA correction for this lens was studied in detail here. Lateral chromatic aberration was found quite unexpectingly easy to correct by a graphic application such as Adobe Photoshop CS and CS2 Camera Raw Module. CA is about linearly spead along the radius of the circular image and therefore can be corrected with the "two sliders" systems. I must confess not having the same success in attempting to correct CA on JPEG file though with PS CS2. Unfortunately, the lateral chromatic aberrration of this lens is not so linearly spread along the image circle radius. I could only partially correct the CA with the same tools as above (PS CS2 Camera Raw module). Anyhow, it is possible to remove most of the problematic aberration in the range 0-180 degrees of angle of view. In effect that is sufficient to get clean panoramas as the rest of the image (> 180 dedeg)should not be sisible in this output. 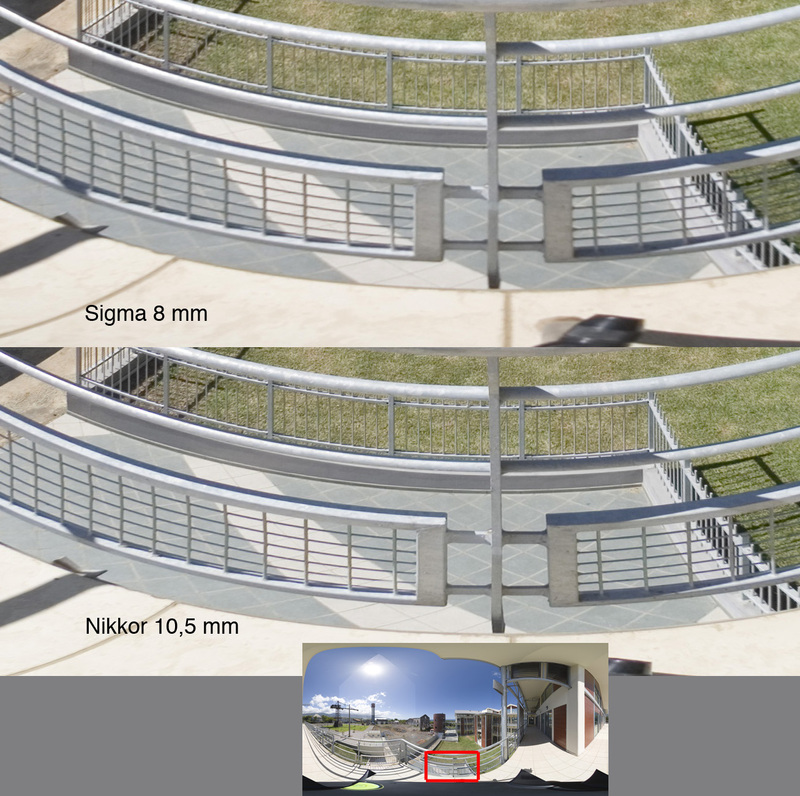 These conclusions are drawn from some photographs taken with the same set-up as the Sigma lens. When processed in RAW format, both lenses produce images that can be well corrected up to the usefull angle of view. The Sigma images can apparently be totally cleaned with PS CS Camera Raw to 180 degrees of Angle oView. The Nikkor image is a little harder to clean up. Not so if one needs to use less than 180 degrees of Angle of view. Some lateral color is left over at larger Angle of View values. To simplify the presentation only extreme apperture settings shall be shown. Of course the indermediate settigs would fall in-between these shown data. What about other types of lenses? Both lenses produce very good photographs with equally very moderate light fall-off toward the edges when shots are taken two or more stops below full open aperture. The Nikkor lens is however slightly better as "visible" loss of light happens beyond Sigma smaller angle of view.No correction at all is really necessary then on both lenses and the modern blenders shall take care of the remaining lack of illuminance. It has been found that some correction can be applied to the images shot with the Sigma if needed (i.e. images shot at fully open aperture). PS CS Camera Raw Module (CRM) is unfortunately not really adapted to circular fisheye images (as CRM applies correction starting from the corner of the image rectangle) but at least with APS-C sensor sized images, the illuminance can be really spread even all over the rectangle of the image. Other means will be better suited for smaller relative circular images (i.e. on a FF Canon EOS) as almost no effect shall result from CRM vignetting correction. That is also the case for the Nikkor image on a FF Canon EOS as the outer part of the surface is void of data beyond the image circle. Of course the slight loss of illuminence that could be noticed on images shot on the standard Nikon DSLRCameras (or APS-C Canon EOS) can be fully corrected in PS CS CRM. This lens is a very well designed on par with other high end Sigma products. The focus distance scale slides smoothly and is very well spread over almost 360 degrees around the barrel of the lens. Depth of field can therefore be well estimated on the same scale. Beware that focusing "beyond infinity" can be done if not carefull to stop at the label sign. As with most other Canon EOS mount compatible lenses, there is no manual aperture ring on the model as it is shown on this photograph. This lens is of a very well design and of apparent very good quality. The focus distance scale slides smoothly but it is the weakest point of the lens. It spans only on a small part of the barrel as it is visible on the photograph and the printing is poorly precise: compare with the Sigma on the photograph. Consequently, from my point of view, the DoF scale that is also engraved on the lens is useless. I personnally cannot refrain myself from thinking that this bad design was willingfully done by Nikon just to induce the user to select the automatic focusing mode. This is of course available only on the genuine Nikon DSLR cameras and justify the workaround solution proposed by some vendor on the web. As any other Nikon "G" lens there is no manual aperture setting ring on it as is shown on this photograph. This subject could well be slightly of topic. The modern SLR technology make the accurate knowledge of the current aperture setting rarely required. Coupling of the aperture with exposure duration is estimated and performed by some electronics that uses the information given by one or several sensors. Furthermore, the exposure that is measured is not an absolute value and it depends strongly on the scene illumination level and evenness as well as on the method of measurement (spot or wider area) and also on the lens specifics such as light fall-off, etc. Despite this facts, I had to consider this subject because manual control of the aperture setting is mandatory when the Nikon fisheye lens is adapted on a Canon SLR: There is no ring at all and when it's needed, one has to guess the aperture that is currently set. This need may arise for instance possibly in complement and in the context of this workaround solution. 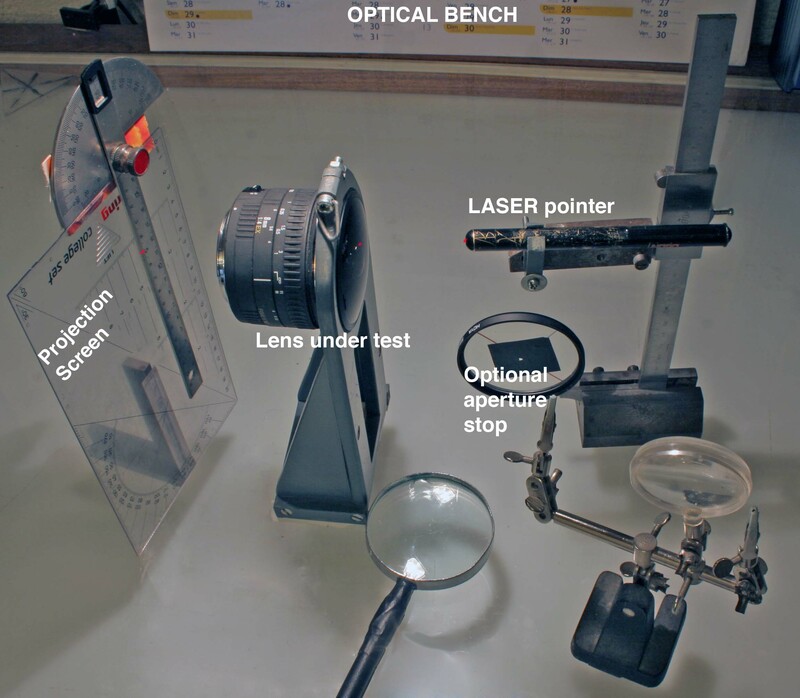 In this case, in order to possibly print and stick an aperture scale on the lens, only two positions are available and can be at first "engraved" . That correspond to the mechanical stops on both ends of the aperture scale i.e. f/2.8 and f/22 respectively. The other intermediate stops have to either guessed and could be engraved at equal space in between these extreme known positions. When I discoveredd on the field that this did not really fit, I have subsequently decided to investigate the subject in more depth. 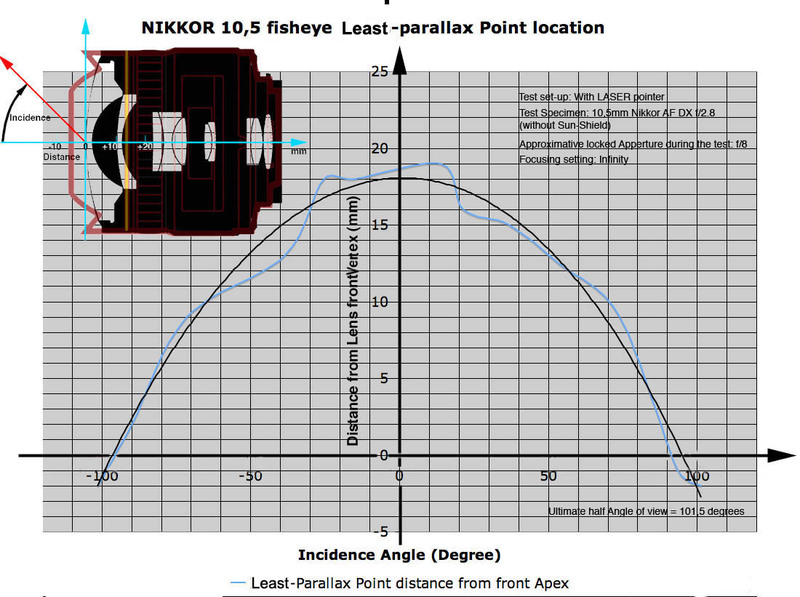 I have used two other suplementary lenses in order to be able to completely assess the actual spread of the aperture "stops" that Nikon uses for the Nikkor 10.5mm. They complemented my Sigma 8mm that is fitted with a Canon EF mount and spread its scale from from f/4.0 to f/32 and subject of the comparison with the Nikon fisheye lens. I have first verified that the two EF mount equiped lenses have aperture stops that each consistantly matches the measured exposure duration linked with the correct mathematical relationship (i.e. double the duration when closing one further stop). It's the case. Then, from successive exposure measuremenst of the very same scene, I have drawn the following detailed and comparative graph. A significant mechanical hysteresis isdetected that is obviously caused by mechanical slack in the complex linkage between the manually driven ring and the diaphragm. The values that are engraved on the manually rotated aperture ring are linearly distributed. This does not match the mathematical expected distribution: the curve is rather wavy (more than one EV of fluctuation)! The range is shrunk as unexpectingly more light pass through the lens at full opening and less when fully closed when compared to the correct range spread of the Canon EF 50mm. 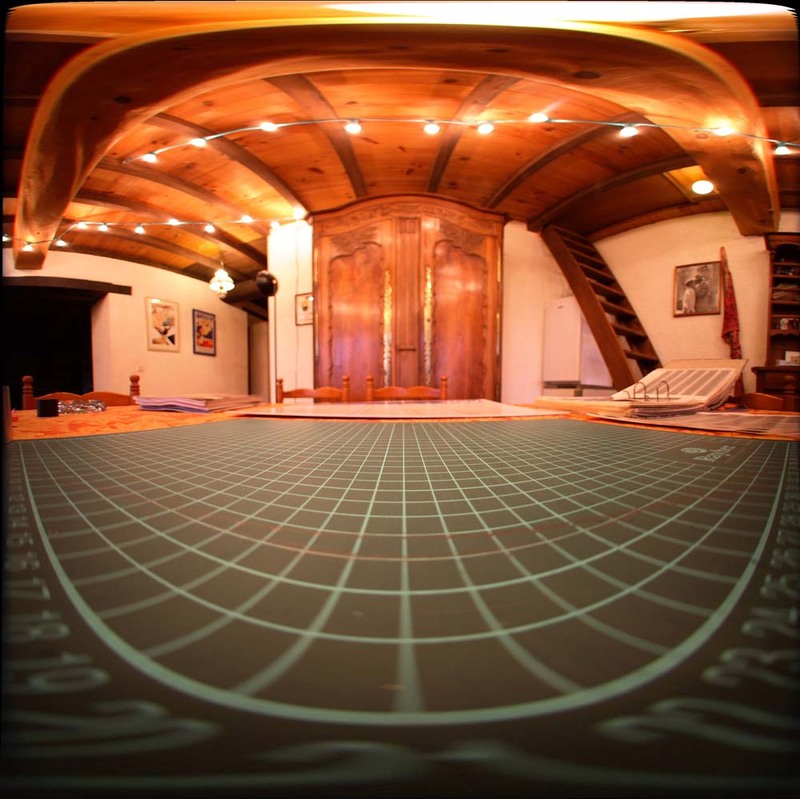 These different complementary measurement help in discovering that the specification given by Nikon for its fisheye is shy when considering the actual length of the aperture scale function.. 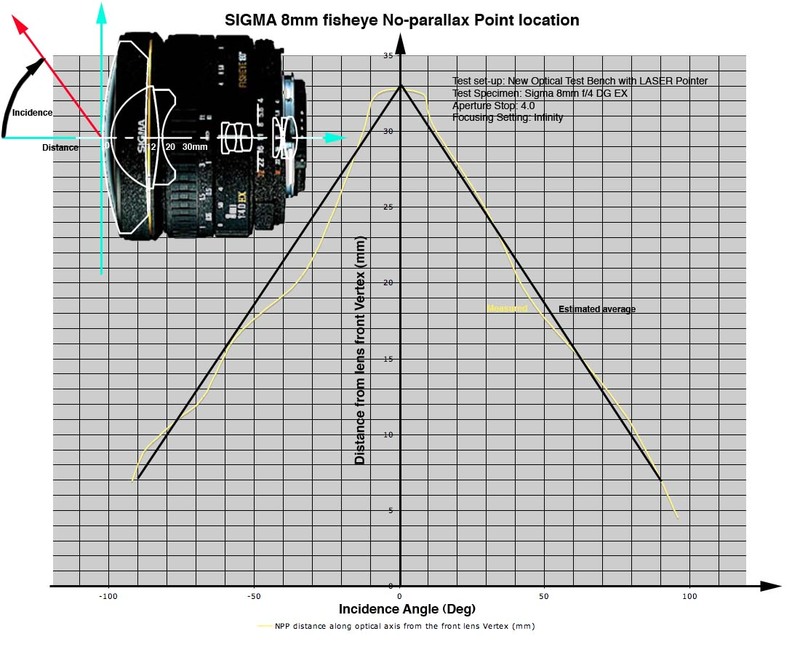 The Sigma 8mm exhibits a very standard behaviour: the length of the scale is correct and the distribution of "stops" along it is mathematically correct. The maximum absolute opened value (f/4.0) could be challenged however as it may have been a very little exagerated for marketting reason. F/2.8 seeems to match about f/2.6 or so when compared to the Sigma and in association with other suppementary information. F/22 seems to better match f/32. In short, I believe that, in comparison to the Sigma scale (f/4.0-f32) taken as reference, the Nikkor seems to have in fact a (f/2.8 - f/35) overall aperture range. BTW, it could be possible to verify the validity of the absolute actual maximum aperture by software in using computed information and data provided by Nikon in this US patent. There, Nikon stated f/2.8 as both being specified and being a computed data. 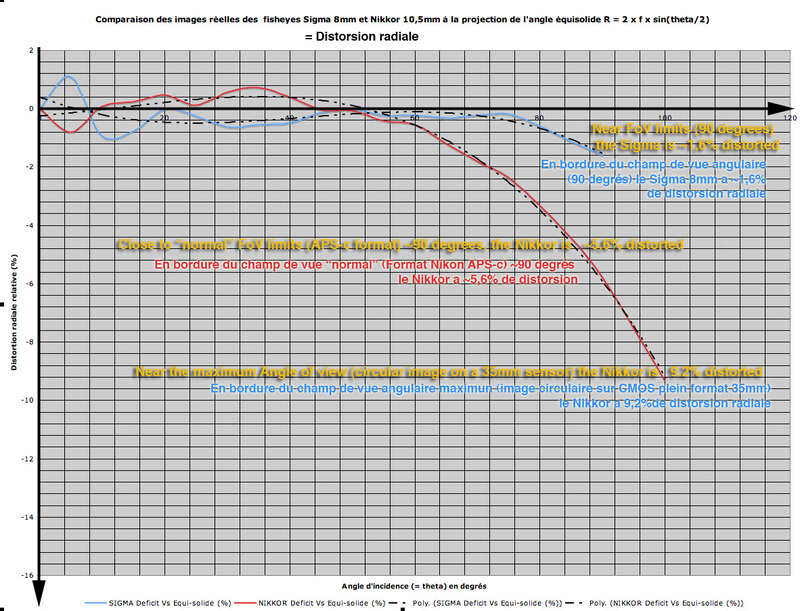 That would mean in another hand that (f/4.3 -f/35) is then better to define the Sigma aperture range capacity. Rev 15 Dec 2006: "Notes / reminders" addition.